Scientists at the Gladstone Institutes identified two chemicals that improve their ability to transform scar tissue in a heart into healthy, beating heart muscle. The discovery advances efforts to find new and effective treatments for heart failure. Heart failure afflicts 5.7 million Americans, costs the country $30.7 billion every year, and has no cures. When heart muscle is damaged, the body is unable to repair the dead or injured cells. Gladstone scientists are exploring cellular reprogramming—turning one type of adult cell into another—in the heart as a way to regenerate muscle cells in the hopes of treating, and ultimately curing, heart failure. 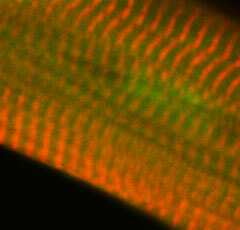 It takes only three transcription factors—proteins that turn genes on or off in a cell—to reprogram connective tissue cells into heart muscle cells in a mouse. After a heart attack, connective tissue forms scar tissue at the site of the injury, contributing to heart failure. The three factors, Gata4, Mef2c, and Tbx5 (GMT), work together to turn heart genes on in these cells and turn other genes off, effectively regenerating a damaged heart with its own cells. But the method is not foolproof—typically, only ten percent of cells fully convert from scar tissue to muscle.